In the latest trading session, Johnson & Johnson (JNJ) closed at $145.91, marking a -0.08% move from the previous day. This change was narrower than the S&P 500's 0.15% loss on the day. Elsewhere, the Dow lost 0.32%, while the tech-heavy Nasdaq added 0.42%. Prior to today's trading, shares of the world's biggest maker of health care products had gained 0.88% over the past month. This has lagged the Medical sector's gain of 1.8% and outpaced the S&P 500's loss of 1.1% in that time. Investors will be hoping for strength from JNJ as it approaches its next earnings release, which is expected to be January 22, 2019. In that report, analysts expect JNJ to post earnings of $1.95 per share. This would mark year-over-year growth of 12.07%. Our most recent consensus estimate is calling for quarterly revenue of $20.11 billion, down 0.42% from the year-ago period. Looking at the full year, our Zacks Consensus Estimates suggest analysts are expecting earnings of $8.16 per share and revenue of $81.32 billion. These totals would mark changes of +11.78% and +6.37%, respectively, from last year. Any recent changes to analyst estimates for JNJ should also be noted by investors. Recent revisions tend to reflect the latest near-term business trends. With this in mind, we can consider positive estimate revisions a sign of optimism about the company's business outlook. Ranging from #1 (Strong Buy) to #5 (Strong Sell), the Zacks Rank system has a proven, outside-audited track record of outperformance, with #1 stocks returning an average of +25% annually since 1988. The Zacks Consensus EPS estimate remained stagnant within the past month. JNJ is currently a Zacks Rank #2 (Buy). Digging into valuation, JNJ currently has a Forward P/E ratio of 17.89. This valuation marks a premium compared to its industry's average Forward P/E of 14.67. It is also worth noting that JNJ currently has a PEG ratio of 2.28. This popular metric is similar to the widely-known P/E ratio, with the difference being that the PEG ratio also takes into account the company's expected earnings growth rate. The Large Cap Pharmaceuticals industry currently had an average PEG ratio of 2.03 as of yesterday's close. 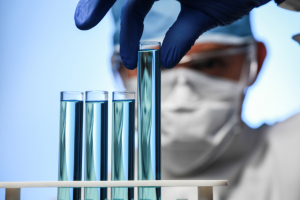 The Large Cap Pharmaceuticals industry is part of the Medical sector. This group has a Zacks Industry Rank of 98, putting it in the top 38% of all 250+ industries.